This qualification is applicable to any private or public sector working environment. Individuals working towards this qualification will learn that supervisors and managers have legal and moral obligations to ensure health and safety within a business and that these include obligations to employees, contractors, suppliers and members of the public. They will also be able to take responsibility for ensuring the competency of the workforce and for identifying hazards, implementing controls and taking appropriate corrective action when necessary. By employing an individual with this qualification, businesses can demonstrate their legal requirement to engage a 'competent person' by having staff trained to this level. 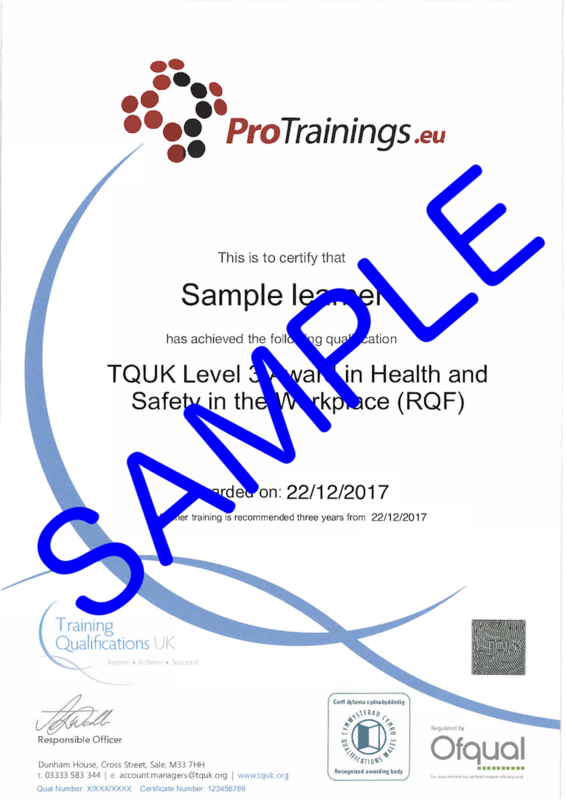 This Ofqual approved qualification has been developed specifically for insertion into the Qualifications and Credit Framework with full support from Pro skills. It is therefore fully relevant to industry and regulatory standards as well as being recognised by the Health and Safety Executive, independent auditors and enforcement officers.